SFIA, the Skills Framework for the Information Age, is the technical competency and skills framework underlying several of the assessment and standards areas in both CITPNZ and CTech. SFIA was created to provide a method of mapping an individual’s professional skill level to a set of internationally-relevant standard definitions. The SFIA Framework is the skills framework underlying most international IT accreditation programmes being implemented around the world by the Institute's kindred partners. This also provides a standard benchmark to ensure true international recognition of a country’s certification programme. The Generic levels define levels of responsibility and competence for IT professionals (from 1 to 7). The Specific Skills include definitions of 96 specific IT "skills", covering all aspects of the entire spectrum of IT professional roles, and defines each of these within the same 7 levels of responsibility. The net result - a matrix of skills on one axis, competencies on the other. An IT professional can then identify the skills that relate to their specialties and work out at which competency level they are operating at. SFIA defines 7 levels of Responsibility, each defined within the context of Autonomy, Influence, Complexity and Business Skills. These 7 levels describe the progression of a practitioner from "Follow", being someone in an entry-level position with no discretion and working under close supervision, through to "Set strategy/inspire/mobilise", being someone with overall responsibility for all aspects of a significant area of work. Certified Technologist is set at Level 3, "Apply", being a professional with sufficient experience and training to be responsible for their work under general supervision. Chartered IT Professional NZ is set at Level 5, "Ensure/Advise", being a professional fully accountable and responsible for the outcomes of their work and able to give professional advice. Hence, CITPNZ (for example) is concerned with both the Generic Level 5 definition, as well as the specific skill Level 5 definitions. The generic SFIA Level 3 definition is as follows. Note that the subjective SFIA definitions below paint a picture of the sorts of expectations of someone operating at Level 3 of the Framework. This should NOT be used as a checklist - applicants do NOT need to meet all of the requirements listed, just those relevant to their position. Works under general direction. Uses discretion in identifying and resolving complex problems and assignments. Usually receives specific instructions and has work reviewed at frequent milestones. Determines when issues should be escalated to a higher level. Interacts with and influences department/project team members. Has working level contact with customers and suppliers. In predictable and structured areas may supervise others. Makes decisions which may impact on the work assigned to individuals or phases of projects. Performs a broad range of work, sometimes complex and non routine, in a variety of environments. Applies methodical approach to problem definition and resolution. Understands and uses appropriate methods, tools and applications. Demonstrates an analytical and systematic approach to problem solving. Takes the initiative in identifying and negotiating appropriate personal development opportunities. Demonstrates effective communication skills. Contributes fully to the work of teams. Plans, schedules and monitors own work (and that of others where applicable) competently within limited deadlines and according to relevant legislation and procedures. Absorbs and applies technical information. Works to required standards. Appreciates the wider field of information systems, and how own role relates to other roles and to the business of the employer or client. 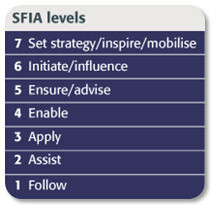 The generic SFIA Level 5 definition is as follows. Note that the subjective SFIA definitions below paint a picture of the sorts of expectations of someone operating at Level 5 of the Framework. This should NOT be used as a checklist - applicants do NOT need to meet all of the requirements listed, just those relevant to their position. Works under broad direction. Work is often self-initiated. Is fully accountable for meeting allocated technical and/or project/supervisory objectives. Establishes milestones and has a significant role in the delegation of responsibilities. Influences organisation, customers, suppliers, partners and peers on the contribution of own specialism. Builds appropriate and effective business relationships. Makes decisions which impact the success of assigned projects i.e. results, deadlines and budget. Has significant influence over the allocation and management of resources appropriate to given assignments. Performs an extensive range and variety of complex technical and/or professional work activities. Undertakes work which requires the application of fundamental principles in a wide and often unpredictable range of contexts. Understands the relationship between own specialism and wider customer/organisational requirements. Advises on the available standards, methods, tools and applications relevant to own specialism and can make appropriate choices from alternatives. Analyses, designs, plans, executes and evaluates work to time, cost and quality targets. Assesses and evaluates risk. Communicates effectively, both formally and informally. Demonstrates leadership. Facilitates collaboration between stakeholders who have diverse objectives. Understands the relevance of own area of responsibility/specialism to the employing organisation. Takes customer requirements into account when making proposals. Takes initiative to keep skills up to date. Mentors colleagues. Maintains an awareness of developments in the industry. Analyses requirements and advises on scope and options for continuous operational improvement. Demonstrates creativity and innovation in applying solutions for the benefit of the customer/stakeholder. Takes account of relevant legislation. The SFIA Framework defines 96 specific "skills", each being a very specific and defined granular skill. These skills are separated into Categories and Sub-Categories. Within each skill exists a definition for all relevant Levels of Responsibility. Certified Technologst is matched to SFIA Level 3 or above, hence applicants must meet the requirements of Level 3 for 1 specific SFIA skill. Chartered IT Professional NZ is concerned with SFIA Level 5. Note that the subjective SFIA definitions paint a picture of the sorts of expectations of someone operating at Level 5 of the Framework. This should NOT be used as a checklist - applicants do NOT need to meet all of the requirements listed, just those relevant to their position. When completing your certification application online, the Institute provides a tool to help select relevant skills, however you can also view all skills on the SFIA Framework Reference (pdf). Categories are selected on the left of that page, followed by Sub-Categories, followed by the specific skills. The specification, design and maintenance of mechanisms for storage and access to both structured and unstructured information, in support of business information needs. Develops specialist knowledge of database concepts, object and data modelling techniques and design principles. Translates object and data models into appropriate database schemas within design constraints. Interprets installation standards to meet project needs and produces database components as required. Evaluates potential solutions, demonstrating, installing and commissioning selected products. Maintains and applies up to date, specialist knowledge of database concepts, object and data modelling techniques and design principles, and a detailed knowledge of the full range of database architectures, software and facilities available. Analyses data requirements, to establish, modify or maintain a data model. Takes account of specialist requirements (e.g. geocoding, for geographic information systems). Interprets the model into an appropriate database schema within set policies. Demonstrates, installs and commissions selected products. The design, creation, testing and documenting of new and amended programs from supplied specifications in accordance with agreed standards. Designs, codes, tests, corrects, and documents moderately complex programs and program modifications from supplied specifications, using agreed standards and tools. Conducts reviews of supplied specifications, with others as appropriate. Sets local or team-based standards for programming tools and techniques, advises on their application and ensures compliance. Takes technical responsibility for all stages in the software development process. Prepares project and quality plans and advises systems development teams. Assigns work packages to technical staff, monitors performance and reports progress. Provides advice, guidance and assistance to less experienced colleagues as required. Testing embraces the planning, design, management, execution and reporting of tests, using appropriate testing tools and techniques and conforming to agreed process standards and industry specific regulations. The purpose of testing is to ensure that new and amended systems, configurations, packages, or services, together with any interfaces, perform as specified, and that the risks associated with deployment are adequately understood and documented. Testing includes the process of engineering, using and maintaining testware (test cases, test scripts, test reports, test plans, etc) to measure and improve the quality of the software being tested. Reviews requirements and specifications, and defines test conditions. Designs test cases and test scripts under own direction, mapping back to pre-determined criteria, recording and reporting outcomes. Analyses and reports test activities and results. Identifies and reports issues and risks associated with own work.